Jane was at home one day in early March 2006. She had left work at coffee time the previous day, unable to work because of a particularly bad migraine headache. “I felt the migraine attack coming on as I drove in but took my usual medication and hoped I would get through the day. But by 11am I was throwing up and could hardly see. My boss had to take me home,” she says. Jane’s migraines had started in her teens but had got much worse, probably through the stress of her accountancy job and long hours staring at a computer screen. “I woke up the next day with my head still pounding so didn’t go in, but by the middle of the afternoon, it all cleared like a fog lifting.” Feeling better but in a mood not to really bother to do anything, Jane started browsing on the Internet. She came across a BBC news story online that described a German trial of acupuncture for migraine. “The trial involved something like 900 people who suffered migraine headaches regularly. Nearly half of them responded to acupuncture really well. Their migraine headaches were less severe and they didn’t get so many attacks. Sometimes I can get more than ten a month, which is awful – anything less would be a huge improvement,” she says. Jane became hooked on finding out more and spent the rest of the evening searching for information and data on different Internet sites. “Although some were obviously from people wanting you to go to them for acupuncture, there seemed to be quite a bit of scientific evidence that acupuncture could really help. It also impressed me that the technique did not really have any side effects – yes, you have to have acupuncture needles stuck in you but I was more worried about the drugs I was taking,” says Jane. Jane had never tried any form of alternative medicine before and she was quite sceptical, even after reading reports of acupuncture looking promising. “I wanted to make sure that I found an acupuncture practitioner who was safe and reliable – I didn’t want to end up in a seedy front room somewhere,” laughs Jane. She opted to go and see her GP who is well known for supporting alternative medicine for conditions that could benefit and he recommended two local acupuncture practitioners that he knew were reliable and well-liked. Jane’s GP did actually point out that acupuncture was not completely free of side effects – if the practioner is not reputable, skin infections (from dirty needles) are not unusual. There have even been reports of people getting punctured lungs! “I was quite impressed – the consulting rooms of the acupuncturist were in the local Alternative Medicine Centre, which appeared like any other medical centre. The reception was just like a doctor’s waiting room at quite a nice practice and everywhere was very clean and comfortable,” says Jane. 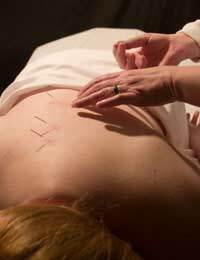 The acupuncturist took time to explain what he was going to do and that she would have most of the treatment needles in her head and face, with some strategically placed in her shoulders and neck. “I also got a head massage, which was wonderfully relaxing – I felt great afterwards,” she remembers. The idea was to have a course of 8 treatments, each one week apart and keep a migraine diary. “I had been keeping this for 8 weeks before treatment and I was having around 3 attacks each week,” says Jane. Jane was also advised to give up caffeine as this is a known trigger for migraines even in small amounts. “I gave up caffeine during the first 8 week period, before having the acupuncture – it certainly did me no harm but the migraines didn’t change frequency at all,” she says. After the first two weeks, Jane thought she had made a mistake. “The sessions weren’t cheap and in the first week I had four migraines, then three in the second. I was devastated,” says Jane. But, after the third session Jane sailed through a whole week without an attack, then another week, then another. “I was completely migraine free for 5 weeks – that was so unusual, I just couldn’t believe it,” she says. After the first 8 weeks of treatment with acupuncture, Jane had just 9 migraines, compared to over 24 in the previous 8 weeks. “And seven of them were in the first two weeks, so I was really pleased.” Jane now goes for a regular session once a month to keep the migraines firmly under control.